Horsham Hockey Club’s bid for glory in the Mixed Trophy at the National Cup finals ended in heartbreak at the Olympic Park over the weekend. It was the second time in four years Horsham made it to the finals of the English Hockey Trophy and the second time their dream ended in disappointment. It was an anticlimax at London’s Lee Valley pitch as they lost their semi-final clash on Saturday, although they tempered that disappointment to finish in third-place for the bronze prize. In the semi-final, they started slowly against Bedford although, by half-time, with the score 0-0, they were looking the better side. However, a poor backfield transfer was intercepted and a stranded Andy Isaacs fouled the Bedford forward. The ensuing penalty was converted, to be followed by a virtuoso reverse stick shot into the top of Isaacs’ net. At 2-0 down, Horsham finally started to make a game of it and Joey Humphries found his way behind the defence and fired home. Horsham continued to press but failed to find an equaliser to lose the tie 2-1, with Bedford going on to lose 3-0 to champions Harleston Magpies in Sunday’s final. Experienced international Freddie Campbell felt some of the players may have been overawed. He said: “This was a game where we were clearly the better team and should have won. Some of the players simply didn’t turn up. “It’s the biggest mixed event of the year, at the biggest hockey venue in the country, with a crowd and loud music and a commentator. 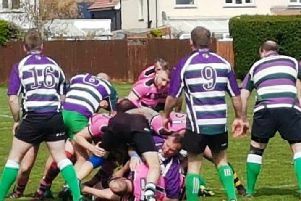 Things started more brightly on the Sunday in the third and fourth place play-off game against Hampstead and Westminster. Horsham went 3-1 ahead with goals from Joey Humphries and Lou Denman plus a short-corner drag flick from Campbell. But once again they went off the boil and three unanswered goals left them staring at defeat. A field goal from Steph Dent restored equality and the game looked set to go to a penalty shoot-out, before Ian Brown netted from a short corner on the final whistle for a 5-4 victory. It saw Horsham take third to add to their 2011 runners-up spot in the competition.